I was writing another piece on the will of God but I could not finish it in time to post it today - it is a long day. That will have to come tomorrow. Meanwhile, since I have restarted my "career" in photography, I should begin a series of "Caption Needed" - starting with this shot. 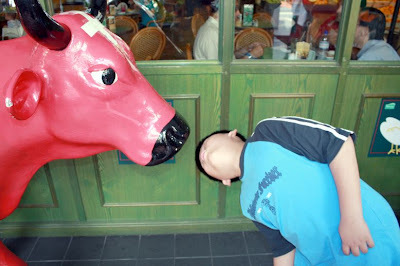 Julia: How now red cow? Danesh: Look buddy, I don't care how much it hurts. I'm going to get my Red Bull juice whether you like it or not! How now red cow? bad, I know. Haha ... I like it! "Look buddy, I don't care how much it hurts. I'm going to get my Red Bull juice whether you like it or not!" Oh my goodness, you had me rolling on the floor laughing! ha ha... I'm glad you liked this one.